- Robert Putnam, 2006 Johan Skytte Prize Lecture. A shared national identity – a sense of ‘we’ that encompasses all citizens regardless of background – is critical to the creation and perpetuity of a nation state. Many mottos capture this spirit of unity amidst diversity, including “E Pluribus Unum” (US), “United in Diversity” (EU), and “Bhinneka Tunggal Ika” (Indonesia). But with rising geographic mobility, there are concerns that growing local diversity poses challenges to the forging of a shared sense of shared identity in the US (Putnam 2007), the EU (Alesina et al. 2017), and other countries. The recent refugee crisis has also reignited debate over how to design resettlement policies to facilitate the integration of diverse groups. Social theorists offer opposing views on how diversity might affect national identity in the long run. Some argue that exposure to new cultures provokes backlash and may incite conflict (Blumer 1958, Huntington 2004). Others posit that negative sentiments may dissipate as intergroup relationships develop over time with greater contact (Allport 1954, Putnam 2007). Recent work also suggests diverse places engender social anomie and isolation, with limited intergroup relationships (Algan et al. 2015). Nonetheless, there is relatively little empirical evidence on how local diversity shapes national identity formation and nation-building more broadly. The main difficulty lies in establishing a causal relationship. Part of the challenge arises because intergroup relationships take time to develop after initial contact. However, over time, local diversity tends to dissipate as people segregate into homogenous communities (Schelling 1971). Therefore, places where diversity persists tend to be naturally advantaged, part of major cities, or ports of entry that attract more tolerant individuals. This makes it difficult to know whether greater tolerance in these areas is due to diversity (and intergroup contact) or due to these other factors. In a recent paper (Bazzi et al. 2017), we address these empirical challenges using Indonesia’s Transmigration programme, one of the largest resettlements efforts in history. Indonesia is an interesting setting to study issues of diversity and nation-building – as the fourth largest country in the world, it is home to over 1,000 self-identified ethnic groups. Between 1979 and 1988, the Transmigration programme assigned two million voluntary migrants (hereafter, ‘transmigrants’) from the Inner Islands of Java and Bali to nearly 1,000 newly created villages across the Outer Islands. Each settlement was endowed with the same public institutions and included a mix of Inner and Outer Islanders. In addition to facilitating population redistribution and agricultural development, the central government envisioned the programme as part of a broader effort to foster nation-building in a new country where different groups historically lived in segregated communities. After declaring independence, Indonesian leaders faced urgent pressures to forge an Indonesian identity that would unite people from diverse cultures across the archipelago, and overcome secessionist tendencies. It was hoped that when transmigrants were sent to new locations, they would mix with culturally disparate groups and break down ethnic divisions. Crucially for identifying the causal effect of diversity on integration, we argue that the Transmigration programme generated a quasi-random ethnic mix in destination locations. Because of logistical constraints and an ad hoc, ‘plan-as-you-proceed’ approach to programme implementation (World Bank 1988), transmigrants experienced as-if random initial assignments to destinations. Moreover, because of land market imperfections and migration costs, migrants appear to be tied to their initial farm plots, limiting ex-post sorting. We demonstrate this using the 2000 Population Census, which shows that variation in local ethnic diversity across these settlements persisted for decades after the initial placement. Figure 2 highlights the continuum of diversity (captured by a standard fractionalisation index) across Transmigration villages compared to the typically more homogenous, non-programme villages. This persistent local diversity suggests limited sorting or segregation dynamics that would have otherwise neutralised the initial policy assignment. It also allows us to identify non-linearities in the relationship between diversity and national identity formation. Our main measure of national identity is whether an individual chose the national language, i.e. Bahasa Indonesia (or Indonesian) as the primary language at home. Across the globe, most people consider language to be an important signifier of national identity, even more important than birthplace (Pew Research Center 2017). Moreover, our focus on language use at home captures a revealed preference of national identity relative to ethnic identity. Although nearly all Indonesians speak the national language, only 20% use it as their primary language at home. The vast majority still primarily speaks their ethnic mother tongue at home. Furthermore, since Indonesian is rooted in the language of one ethnic minority, the Malay, we further argue that Indonesian use at home captures preferences instead of just an ability to speak Indonesian. In Transmigration villages, greater local ethnic diversity led to a significant increase in the prevalence of Indonesian as the primary language used at home. Figure 3 presents a semi-parametric estimate of the adoption of Indonesian as a function of local diversity, captured by the population share of the (transmigrant) Inner-Island ethnicity. 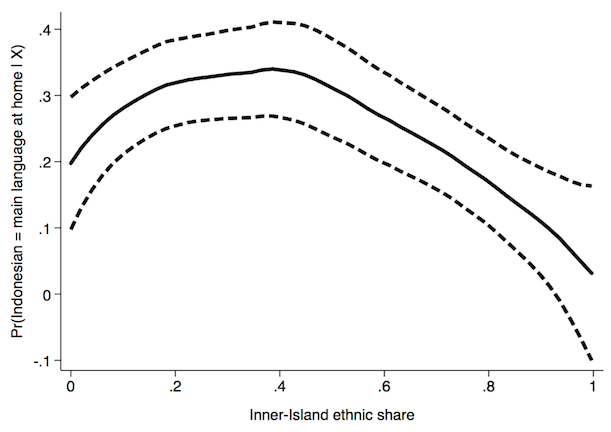 The inverted-U shape suggests that the adoption of the national identity peaks in villages where Inner Island and Outer Island groups are in roughly equal proportion. Similar inverted-U relationships arise for other integration outcomes, including ethnic intermarriages and self-reported Indonesian mother tongue among children. In short, the strongest integration happens in the most diverse communities. These cultural changes constitute significant shifts in the process of socialization and identity formation with broader implications for nation building. Using long panel data that allow us to trace out the intergenerational process of identity transmission, we find that children raised in these types of households exhibit stronger national affinity, less co-ethnic bias, and weaker attachment to their own ethnic identity as adults. The long-run integration in diverse Transmigration villages was by no means a foregone conclusion, as greater diversity could very well have led to segregation or social isolation (e.g. Algan et al. 2015). Our findings are also striking given popular concerns that such large-scale resettlement was a classic case of cultural imperialism that would stoke ethnic conflict. Nevertheless, our results resonate with theories of contact and cultural change and are consistent with a recent reappraisal of the programme (Barter and Cote 2015). Moreover, the effects of local diversity are not uniform across settlements. From a policy perspective, it is important to understand the forces that link diversity with the adoption of a more inclusive national identity. Our research design allows us to identify different factors that may enable diverse communities to facilitate increased integration instead of promoting conflict. Here, we leverage the wide geographic coverage of the Transmigration programme that exposed settlements to different conditions across the Indonesian archipelago. First, increased opportunities for intergroup contact facilitate a greater willingness to integrate. Within settlements, transmigrants were allocated plots by lottery and residentially desegregated villages exhibited stronger integration. Additionally, those living in more remote settlements (and thus with more limited venues for economic activity and exchange with other communities) also tended to integrate more. Second, the economic environment – and its impact on the nature of intergroup contact – can importantly affect integration. We use similarity in agro-climatic characteristics between the migrants' origins in Java/Bali and their eventual settlement as a proxy for the degree of substitutability between transmigrants’ and natives' farming skills (Bazzi et al. 2016). We find that diversity discourages integration when transmigrants’ and natives’ skills were substitutes. This suggests that diversity can negatively affect integration in an economic environment where (initial) intergroup contacts were characterized by competition instead of cooperation. Third, socio-political factors at the local and regional levels can shape how diversity impacts identity choices. This link between diversity and the adoption of Indonesian is stronger in villages (i) where the majority group is itself more ethnically fragmented, (ii) where the linguistic distance between Inner and Outer Islanders is greater (hence, raising the cost to assimilate), or (iii) where transmigrants pose less of a regional political threat (proxied by whether the local native group in the village is a dominant majority within the broader political district). These results suggest that the regional ethno-political balance is another crucial input in designing effective resettlement policies. Indonesia’s Transmigration programme sheds new light on the scope for policymakers to foster positive intergroup relations amidst rising diversity. Residential mixing, linguistic differences, and the extent of political and economic competition between groups determine whether diversity leads to integration, social isolation, or segregation. Many of these conditions are influenced by policy and are particularly salient in designing more effective resettlement programmes. More broadly, throughout history, a shared national identity has been crucial to ensuring socio-political stability in culturally diverse countries. Indonesia’s Transmigration Programme offers a uniquely rich lens to understand how local diversity can contribute to an intergenerational process of nation-building. Algan, Y, C Hemet, and D D Laitin (2015), “The social effects of ethnic diversity at the local level: A natural experiment with exogenous residential allocation,” Journal of Political Economy, 124 (3): 696-733. Allport, G W (1954), The nature of prejudice, Boston: Addison-Wesley. Bazzi, S, A Gaduh, A Rothenberg, and M Wong (2016), “Skill Transferability, Migration, and Development: Evidence from Population Resettlement in Indonesia,” American Economic Review, 106 (9): 2658-2698. Bazzi, S, A Gaduh, A Rothenberg, and M Wong (2017), “Unity in Diversity: Ethnicity, Migration and Nation Building in Indonesia,” Working Paper. Barter, S J, and I Cote (2015), “Strife of the soil? Unsettling transmigrant conflicts in Indonesia,” Journal of Southeast Asian Studies, 46 (1): 60–85. Blumer, H (1958), “Race prejudice as a sense of group position,” Pacific Sociological Review, 1 (1): 3-7. Fearon, J D, and D D Laitin (2011), “Sons of the soil, migrants, and civil war,” World Development, 39, 199–211. Huntington, S P (2004), Who are we? The challenges to America’s national identity, Simon and Schuster. Pew Research Center (2017), “What It Takes to Truly Be ‘One of Us”, February. Putnam, R D (2007), “E pluribus unum: Diversity and community in the twenty-first century - The 2006 Johan Skytte Prize Lecture,” Scandinavian Political Studies, 30 (2), 137–174. World Bank (1988), Indonesia: The Transmigration Program in Perspective, A World Bank Country Study Washington, DC: World Bank.